Omar Court No. 91, Daughters of Isis, an auxiliary of the Ancient Egyptian Arabic Order Nobles of the Mystic Shrine of North and South America and its Jurisdictions, Incorporated, attended the Desert (State) of Georgia Annual Desert Conference festivities in Columbus, Georgia. The Desert Conference weekend included activities for the adults as well as the youth. Being a charitable organization, the Daughters of Isis presented shoe boxes filled with toiletry items to a local shelter to assist those in need. They also presented a scholarship to a local student in the Columbus, Georgia area, to assist with her educational expenses. The Desert of Georgia also sponsors a Desert Queen Contest, an Egyptian Fashion Show and Youth Competition which allows representatives from each city to compete for respective titles. Omar Court No. 91 was elated when Daughter Deloris Dunham was announced as the winner of this contest. The other cities Georgia represented are Atlanta, Columbus, Augusta, Valdosta, Albany, Darien and Macon. 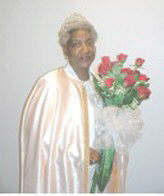 Through her persistence, hard work and with the support of the Daughters and Nobles of Omar Court and Omar Temple, Dt. Dunham was victorious in her quest to represent the Desert of Georgia as their Queen and she will represent Georgia as the Queen until Desert Conference 2009. Daughter Dunham also serves Omar Court No. 91 as the Illustrious Treasurer. She is the wife of Past Potentate Noble Ezekiel Dunham. Daughter Jenean Turner represented Omar Court in the Egyptian Fashion Show. Representatives from each Oasis were dressed in Egyptian costumes to represent an Egyptian Goddess. Daughter Turner chose to dress as a wealthy Egyptian Goddess. Though she did not win, she did place as the first runner up. The Isiserettes – Omar Court’s youth group was also victorious in their drill competition. These young people, under the direction of Daughter Tonya Gordon, Directress and Daughter Frazier Childers, Co- Directress, practiced every week to perfect their routine for the drill competition. Omar Court is very proud of their Isiserette’s for all of their commitment, enthusiasm and talent. Membership in the Isiserette’s is open to young people between the ages of five and seventeen. The Isiserette’s provide an avenue for young people to learn how to be responsible and productive citizens in our community by helping others and themselves.